On December 20, 1989, the United States invaded Panama in order to overthrow the dictator Manuel Noriega, who was later convicted on drug charges in the U.S.
Operation Just Cause was the 1989 U.S. invasion of Panama. It resulted in the ouster of Panama's military leader, Manuel Noriega, the dissolution of the Panamanian armed forces, and the installation of President Guillermo Endara. 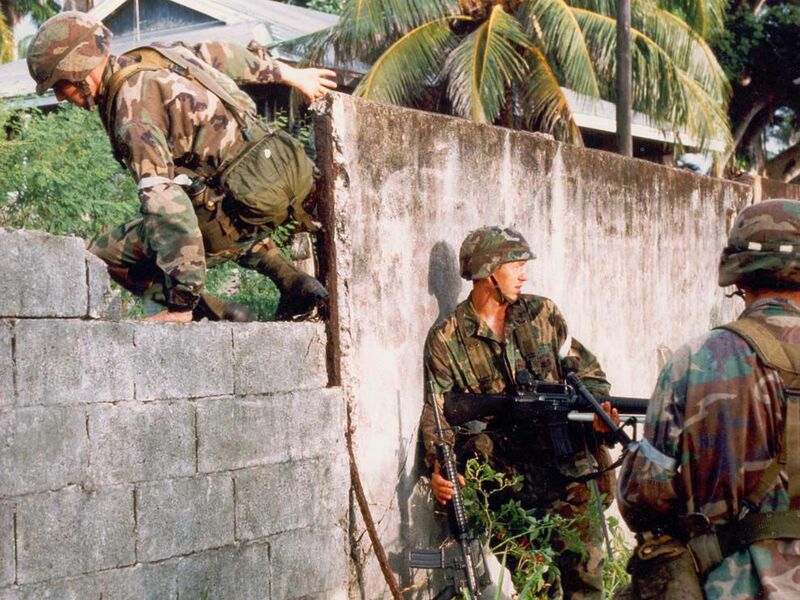 On December 20, 1989, the United States began “Operation Just Cause,” a large-scale invasion of Panama conducted to remove its leader, General Manuel Noriega, from power. Noriega had been a Cold War ally of the United States since the 1970s. He supported the U.S. in the containment of communism in Central America. However, Noriega was also a dictator who helped make Panama a haven for drug trafficking and also accepted aid from communist nations such as Cuba, Nicaragua, and Libya. Operation Just Cause was protested by the United Nations, the Organization of American States, and other international organizations. Nevertheless, Noriega was convicted of drug trafficking, racketeering, and money laundering—the first time that a U.S. jury convicted a foreign leader in a criminal case. He served prison sentences in the United States, France, and Panama for his crimes. Noriega passed away in 2017.
type of economy where all property, including land, factories and companies, is held by the government. act or policy of limiting the spread of an idea or influence. to find someone guilty of an illegal act. legal dispute involving the government. person with complete control of a government. buying, selling and transporting of illegal drugs. process by which the financial proceeds from a criminal activity are made to appear "clean"—as if they were profits from legal activities. behavior in which a person or organization establishes a "racket," or organized illegal activity.